The Anhui Arts Troupe will pay a visit to Trinidad and Tobago for a series of performances to celebrate the 66th Anniversary of the People’s Republic of China. 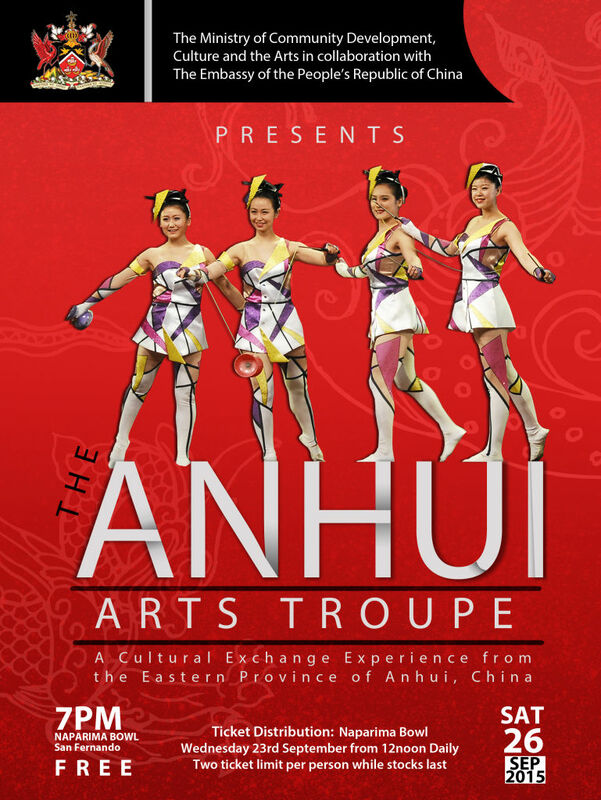 Hailing from the Eastern Province of Anhui in China, the Anhui Arts Troupe are a well travelled performing company. Their visit to Trinidad is part of a wider tour of the Caribbean as part of the anniversary celebrations during the month of September. The September 26th performance is part of an ongoing cultural exchange programme between the Ministry of Community Development, Culture and the Arts, in collaboration with the Embassy of People’s Republic of China. Click here for a look at previous cultural exchange activities with China as well as visit the National Philharmonic Orchestra‘s photo gallery. Anhui province is well known for being the home of over 100 performing arts troupes. Performers travel the world sharing China’s many and varied cultural forms – from opera to acrobatics. Ticket Distribution starts on Wednesday 23rd September from 12 noon daily. There is a two ticket limit per person while stocks last.